Jihadist rebels continue, for the third day, their wide-scale offensive in southern Aleppo aimed to lift the siege on the districts they control in the eastern parts of the embattled city. Today’s battles have, so far, granted the insurgents full control on Sawmills area in Minyan following fierce battles with the government troops; now holed up at the adjacent Cardboard factory. In Ramouseh district, several Army troops were reported dead when the hardline militants in Sukkari district detonated a tunnel under a building used as a barrack. Pro-rebel accounts on social media claimed that dozens of Army soldiers, including officers, have been captured by the jihadists in Ramouseh. Al Masdar News could not verify the authenticity of these claims. “A homegrown rocket also hit the perimeter of the Assad Military Academy. Only material damage reported”, he added. According to the State-run news agency SANA, 6 civilians have been killed, 11 others injured as Islamist rebels shelled a government-held neighborhood with rockets filled with toxic gas. Why in the h**l didn’t Russia keep the fight going when they had these terrorists on the run? Instead they “negotiate” with the lying United States who stall to re-arm the terrorists. Can Russia really be that gullible? Sytian front liners call HQ and say “we are in carboard factory; enemy is in factory to our west or nort”; then HQ gives coordinates to RuAF who come by with 2 Aircraft and deliver 4 KAB-1500 on top of thos buildings. That militant wave is done and counter attack can ensue. Also; SAA troopers can use yellow smoke to help pilots see where militants are causing trouble. A mere “100 m west of smoke” is giod enough for AF to focus in on. One thing about militants and those supporting them: they care little about “col. damage” and go all out targetting everything in non friendly zone. This may cost Syrians greatly, as it gives militants huge advantage. As always RuAF must come to the rescue! If Assad had decided to take the COIN/Gunship aircrafts way, they’d all be finished for long. And Russia+EU should HIGHLY consider it, and FAST. 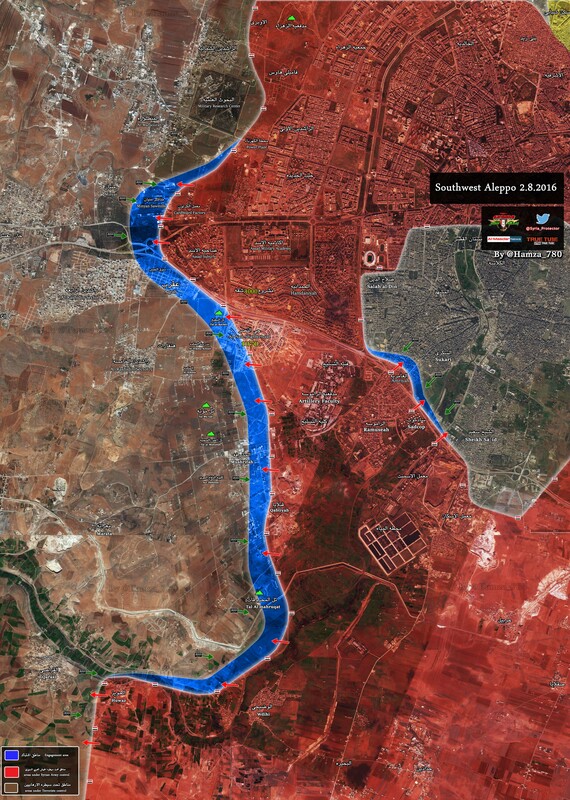 when terrorist advance 100 mts or take one empty building..is a great advance…well its just propagande..look at map of Aleppo…they are losing in Aleppo in the same way they lost Damascus!.